"Your rap career is not over! … Tonight, the after party to end all after parties." 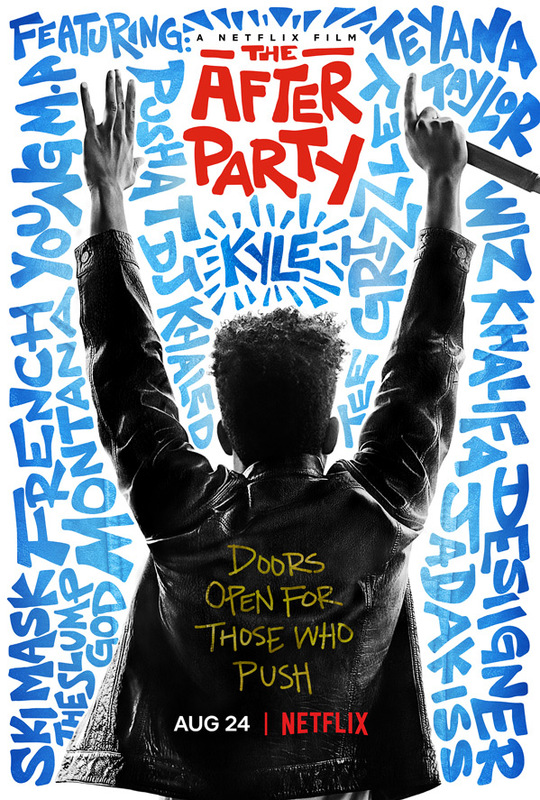 Netflix has launched a trailer for an indie comedy titled The After Party, a film about an up-and-coming rapper who almost ruins his career when he pukes on Wiz Khalifa. His friend convinces him to take him to an after party where he'll have another shot at making it big if he can perform and impress the attendees. The story takes place during "one wild night", of course. The cast includes Kyle Harvey, Harrison Holzer, Shelley Hennig, Teyana Taylor, Jordan Rock, Amin Joseph, Andy Buckley, and Blair Underwood; featuring cameos by Wiz Khalifa, French Montana, DJ Khaled, Ski Mask the Slump God, Desiigner, Pusha T, Jadakiss, Tee Grizzley, Young M.A., and more. This looks funky and entertaining, but nothing that will make a real mark in the end. When an aspiring rapper (Kyle Harvey) goes viral for all the wrong reasons, he thinks his career is over. But when his best friend gets them into a wild NYC after party, he gets one more chance to make the impossible happen. The After Party is both written and directed by filmmaker Ian Edelman, making his second feature film after directing Puerto Ricans in Paris previously, and creating the TV series "How to Make It in America". Produced by Q, Jamie Patricof, Katie McNeill, Douglas Banker, Trevor Engelson, Jake Stein, and Heather Parry. This hasn't premiered at any festivals or elsewhere. Netflix will release Edelman's The After Party streaming exclusively starting August 24th later this month. Anyone want to watch this?